In the introduction to Psychotic Reactions and Carburetor Dung, published in 1986, you wrote: “It’s not easy to write about a dead friend without veering off into melodrama or sentimentality; melancholy might be the most honest tone, but it’s the hardest to catch.” Now that it’s been 35 years since Lester Bang’s death, how do you feel when you talk and remember him? I miss him. I wonder what he’d think of just about anything. I wonder how he’d write about Trump. If he would have become as immersed in hip-hop as he was in so many other kinds of music, or left music behind, or written books about old musical loves and rants no one would publish. I have no idea what the answers to any of those questions would be. I don’t really wonder what he’d think of the one-man play How to Be a Rock Critic, which I saw in New York in January and wrote about in my February Real Life Rock Top 10 column at villagevoice.com. No one likes to see themselves historicized. But while I felt that way a bit—watching it—Lester recounting his life story, with most of the dialogue drawn from his music criticism—I was constantly saying, I assigned that, I edited that, I co-wrote that, that’s from a letter he wrote to me—I loved it all. About your friendship: can you tell me when and how you met Lester? And how was your relationship? I noticed his reviews in Rolling Stone—I think the first was of the MC5’s Kick Out the Jams, which he hated, and compared to the Troggs, which he put down—of course he later wrote his heart out about both. When I became the Records editor there in June of 1969, I found he was sending in five to fifteen reviews a week, most of which were ignored. I took two to make up the heart of my first section, a definitive hit piece on It’s a Beautiful Day and a historic embrace of Captain Beefheart’s Trout Mask Replica, not because I wanted to cover those records—I didn’t care—but because I wanted to showcase and introduce a particular critic and a particular critical sensibility. As his reviews appeared, record companies began to send Lester records—there were so many being released then—and he felt it was his responsibility to review every record he received. Obviously I couldn’t print everything he sent, but often what I did print was, again, because his pieces were as much a chronicle of his emergence as a critic as they were reviews of records. 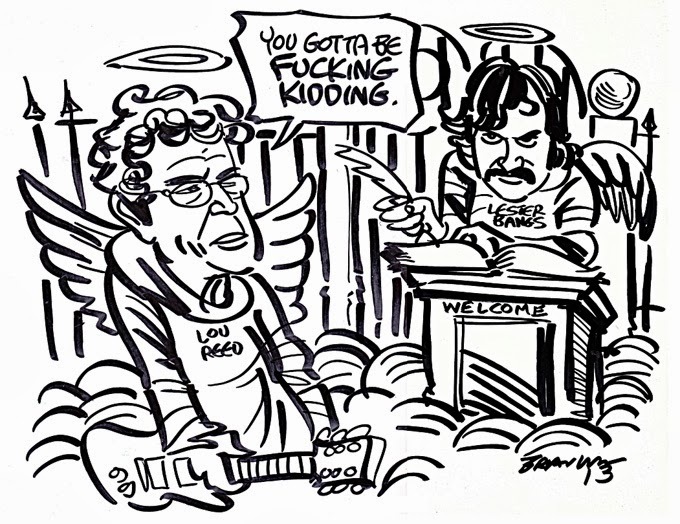 At a certain point, a number of us at Rolling Stone felt we simply had to meet Lester—who was this person? So John Burks, Langdon Winner, and I culled some money out of the paper’s then bare-bones budget and flew him up from San Diego to San Francisco. He stayed with me at first, but my wife was eight months pregnant and he wanted everything done for him and treated women like furniture. So he moved down the hill to Langdon’s house. After many hours of listening and talking music, going to the Rolling Stone offices, introducing him to people, he went back to La Jolla. We were all thrilled to have met him. After he died, when I collected and read hundreds of letters he’d written over the years, I found that this visit had been a terrible trauma and disappointment to him, something he never quite got over. He thought we were flying him up to consider hiring him as an editor, and when there was no offer, he felt rejected—when nothing of the sort had every occurred to anyone. WE JUST WANTED TO MEET HIM. He also felt that when I suggested he stay with Langdon, I was saying he wasn’t good enough to stay in my house—when I was saying it was impossible for him to stay. But he never mentioned anything about that in the scores of letters he wrote me from 1969 until he died. It never came up in the many late night phone calls, some lasting for hours, some with me on the other end listening to silence when Lester had to take a second to do something and then forgot he was on a call and the phone was off the hook and I finally hung up. When Almost Famous came out, with Philip Seymour Hoffman playing Lester, my wife said, “That’s not the Lester we knew.” It was and it wasn’t—Hoffman deeply captured the preaching, caring, teaching Lester. But just as he played an older brother role for the Cameron Crowe character in the movie, I played something of the sort for him. He had always wanted me to edit his first book, a collection of pieces. He often sent me work—genius work—that he couldn’t get published, and I tried to find places that would publish it and always failed, until he died and I pretty much commanded a project I had no legal rights to—though John Morthland and Billy Altman, Lester’s literary executors, approved it—and published them in Psychotic Reactions and Carburetor Dung. Lester Bangs’s story is often told as a celebrity in the rock ‘n roll scene (his presence at parties, bars, concerts), but also as a lonely man. Where is the truth? I knew Lester as a lonely person, and I never knew him as a party person. Let’s talk about writing style: for Bangs someone has coined the definition “Gonzo journalism.” Do you like it and what do you think was the real uniqueness of Lester’s style? The word ‘Gonzo’ was invented by Hunter Thompson to describe his own writing. It was a heroic, self-congratulatory term that meant Go crazy, say anything, the truth is out there somewhere, make it up if you have to, but get your hands on it and wring its neck. Both Lester and Thompson, at his best, in Fear and Loathing in Las Vegas and Fear and Loathing on the Campaign Trail, were humanists, not crazies. They were classicists, not anarchists. But they weren’t afraid of craziness and they weren’t afraid of anarchy. About that, has Lester’s style influenced your writing? What was similar and different? Over and over, when I’ve felt stiff, self-constrained, frozen, I’ll sit down and read a hundred pages of Lester and come away feeling as if I just woke up. Hemingway’s short stories work the same way for me. California, Detroit, New York. What was the ideal place for Bangs in your opinion? Did Bangs give more to the punk scene or vice versa? It’s your question; it’s for you to answer. Bangs had a very direct attitude writing about rock bands, sometimes violent, ruthless. Do you think at that time, rock ‘n roll had to be treated in this way? He had to treat the world that way. Which band, today, do you think Lester would like to write about? The famous clash with Lou Reed is now part of “rock literature.” Wherever they both are, they are clarifying themselves? By playing off each other. You wrote that, sometimes, while you curated the book with Lester’s writings, you felt the need to call him by phone for solace. Does it still happen to you? And what would you ask him? What would you talk about with him? It wasn’t for solace. It was to discuss editorial questions with him. Like, should we include this, or that? If I use this, I have to rewrite it to a degree, because we can’t afford the lyrics you quoted—how do you want to do it? Did you mean to say that, or was it a typo? Stuff like that. This entry was posted in Interviews by Greil Marcus and tagged Greil Marcus, Lester Bangs. Bookmark the permalink. Greil Marcus and Lester Bangs should be in the Rock and Roll Hall of Fame. Greil,the Apollonian, in a class with Edmund Wilson and Alfred Kazin, and Bangs who wrote like Little Richard and Jerry Lee Lewis sang in the fifties. Very illuminating interview, and I appreciate Greil Marcus’s willingness (here and in some of the Ask Greil writing) to open up about some of those interactions, because it’s brave in this age to share details of a complicated relationship with anybody. One thing: He lived in La Jolla then? Not El Cajon or Chula Vista?